The parish and village of Kingswear is sat opposite Dartmouth along the banks of the river Dart in Devon. It lies within the South Devon area of Outstanding Natural Beauty. There is no mention of Kingswear in the Doomsday Book of 1086, however, there is reason to believe that Kingston, which is on the plateau above Kingswear, dates from the Saxon times with evidence of Stone Age and Roman occupation. After the conquest Kingston passed into the hands of the ‘de Vasci’ family and the first written mention of Kingswear was around 1170 when William de Vinci gave half the land at Kingswear to the local church which at that time came under the jurisdiction of Totnes Priory. The name Kingswear may be associated with a tidal mill at the head of the creek with its system of weirs. 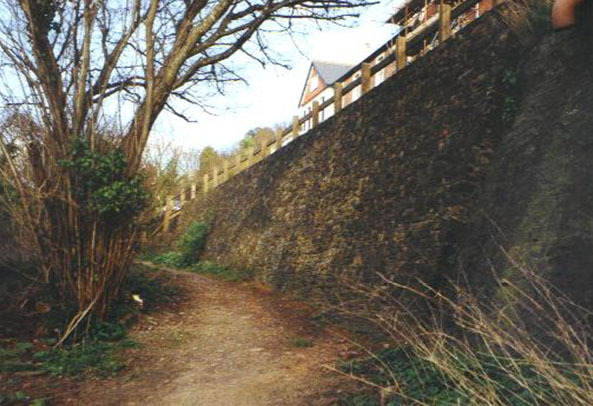 A wall retaining a road was in danger of collapsing and we were asked by the Local Council Authority to carry out the stonework for a new wall. 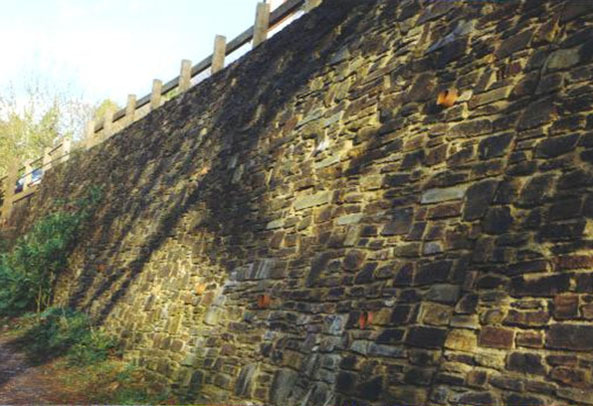 Once the old wall was demolished a cast concrete retaining wall was constructed to retain the road and once completed we faced the concrete with stone. The stone is a natural rustic slate and came from ‘Lantoom’ quarry which is situated at Dobwalls in Cornwall. The stonework is built on a batter which means it is constructed on an angle back from itself and is tied back to the concrete face by means of dovetailed stainless steel anchor ties. These ties fit into slots within the face of the concrete which are formed whilst the concrete is being cast. They are known as ‘Abbey’ slots. A ferry between Kingswear and Dartmouth has been operating here dating as far back to at least 1365 A.D. from Kittery Point, the western most tip of Kingswear and the shortest route across the river to Dartmouth. Kittery was an area of the village south of the point which is now at the house known as Kittery Court on the site of the former Kittery Quay. In 1636 Francis Champernowne sailed from here to the mouth of the Piscataqua River in Maine U.S.A. and founded there the town of Kittery.